This may seem like a strange topic, but what I want to touch on today is not just the idea of having interesting, thought-provoking discussions....but rather of starting those conversations necessary for growth specifically in a relationship. 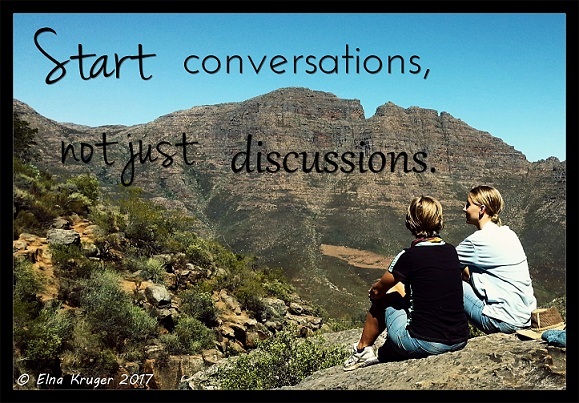 When children are young this seems to be an irrelevant issue, but as they grow older, the need for meaningful conversations becomes obvious and you need to have enough time to have those conversations. There is nothing better to build the relationship than those ‘late- night’ or unplanned meaningful conversations with a teenager/young adult. Take any relationship, especially those close relationships, for example, between husband and wife, or parents and children, or close friends...and think about the conversations that meant the most to you. Usually those would have been the conversations about deeper, meaningful things, and not the superfluous discussions of the usual topics we have with people in general. I distinguish between discussions and conversations by looking at the purpose it has. Both have a place in building relationships and for communication purposes. Discussions are part of everyday communication, when talking about how things are in general, the weather, the household, the children’s health, etc. This is all without having to really share from the heart or really listen to what is being shared. ·	to share pain and resolve misunderstandings. ·	To admonish and discipline a child requires energy, wisdom, insight and tact. ·	To clarify a misunderstanding requires forgiveness, diplomacy, patience and honesty in facing the truth about yourself. ·	To talk about the future with your husband (especially finances!) requires openness, patience and a willingness to negotiate. The list goes on, but the fact is that real ‘heart-to-heart’ conversations are not easy. It requires a willingness to share, and often we are unwilling because we have been hurt by somebody. Now that I have older children I understand better that even those you love the most can hurt you in many ways. It takes a lot of forgiveness to still have a willingness to share when feeling hurt, misunderstood or neglected. And one can be oversensitive when struggling with feelings of insecurity or not knowing you are loved. Currently, in our home there are a lot of discussions, but we make special time for those difficult and important conversations. Topics vary from talking about future plans for a child, or strategically thinking about how to handle academic or sports challenges, to how to handle friendship disappointments. I always tell my children that even ‘fighting verbally’ is better than no communication at all. Where there are no ‘fights’, there are usually no conversations either, and the relationship is in danger of either growing stagnant or deteriorating. Usually a fight is just a symptom of a need to have a better conversation. For me a fight is not a bad thing, it is a pointer to a problem. So next time you are in a ‘fight’ with one of your children or your husband or a friend, schedule a time after the emotion is over, to ‘start a conversation’ (if you value the relationship enough). It may just be the one thing necessary to grow the relationship to a deeper level.